This series, ‘Children of a Dead Earth,’ by Patrick S. Tomlinson, continues to surprise and impress me. Each book manages to be different, each surprises me, and together they tell a continuing story. It is now eighteen years after humans, who have traveled in the ‘ark’ from Earth, have settled on Gaia. Humans and the indigenous life forms on the planet have come to better understand and respect one another and to live and work alongside each other. They’ve even created a pronoun for the multi-sexual indigenous life. It seems to be going well. Until… a terrorist attack on the outskirts of town rock the community. At the same time, a routine flyby of Gaia’s moon uncovers a previously hidden, underground alien building. This building is too complex for Gaia’s population to have built and human’s are still too new in this system to have constructed something this old. Which means…? As for the terrorist attack, it appears that humans have brought with them the idea of a caste system. Many Gaians are sent to live in a ghetto-like community, where natural resources such as water and the ability to grow and harvest food are in scarce supply, so that humans can live in the wealthier areas of the community. And now some of those Gaians are fighting back. While we have these two different story-lines going on, we’re also seeing the effects of a generation gap. Many of our prime characters are young adults who’ve grown up with the Gaians as their close friends and allies and are willing to fight alongside them against their own families. There is so much going on here, and yet Tomlinson moves the story along at a very quick pace. We don’t really get to know any of the characters – you probably need to have read the first two books to get a feel for who these people are and why they are doing the things that they do. But for those of us who have already been in this world, this all feels like a very natural progression. Be warned – the ending is a cliff-hanger. I’ve written before that I don’t care for books that don’t have an ending, but this is different. This is a complete story that gives a huge tease to the future of the series. As much as I’ve clearly enjoyed this book, it doesn’t quite live up to the previous two in the series. It does feel like a natural progression, and perhaps a good bridge (given what appears to be in store), but it’s not the strongest book in the series. Read the other two and you will want to read this one, but don’t pick this one up if you are not familiar with the series. Looking for a good book? 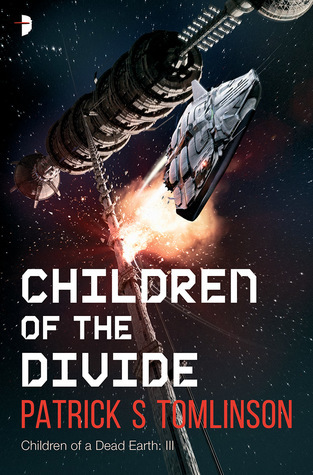 Children of the Divide is another well-written story in the Children of a Dead Earth series by Patrick S. Tomlinson, but you’ll definitely want to be familiar with the series before going into this.